The Rockingham County Quilt Trail celebrates the county’s local agriculture, community artists and rich cultural heritage. The trail’s scenic country route takes you over rolling farmland, through forests, across rivers and into towns and villages in a quest to see 30 authentic quilt blocks by local artisans, each displayed on barns and farm outbuildings. 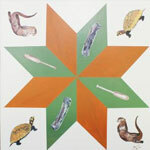 Tradition holds that each quilt block has a meaning and story of its own. Likewise, many participants on the Rockingham County Quilt Trail chose their installations with special significance for their family’s heritage. This self-guided trail takes you through Rockingham County’s beautiful rural landscape, where you’ll see historic tobacco barns, vineyards, farm stands and country stores. Depending on what time of year you visit, farms may also offer seasonal produce or other goods for sale. You can travel the whole trail in a day, or perhaps spend a little more time along the way and drive the trail in sections. When traveling the Quilt Trail, please be considerate of private property. 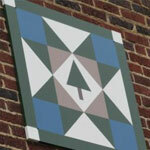 For more information and an interactive map, visit the Rockingham County Quilt Trail website. 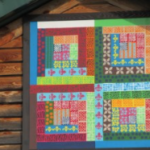 Located just outside of Eden on the side of a log cabin that’s over 100 years old, the Pin Oak Farm quilt square was created by the granddaughter of owners Stanley and Mona Farmer. 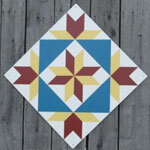 The pattern for the square comes from a quilt made by Mona’s grandmother and it is a traditional log cabin pattern. This antique store in Eden is located in a log cabin and sits near the Virginia and North Carolina border. 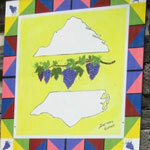 The quilt square design features outlines of Virginia and North Carolina along with grapevines in between to represent the dividing line between the two states. The City of Eden quilt square is located in the John E. Grogan park among the beautiful trees on the campus of Eden City Hall. The square features images representing the city’s natural resources and wildlife including otters and turtles. The park also features a plaza, gazebo, walking trail, picnic tables, wind chimes, and so much more. Jimmy & Joyce Webster Farm. Photo courtesy of Rockingham County Quilt Trail. At more than 100-acres, this farm has been in the Webster family since the early 1950s. Jimmy’s father purchased it when he returned from service in World War II and raised tobacco, grain, and livestock. While those crops are now part of the past, today the farm includes a small vineyard. 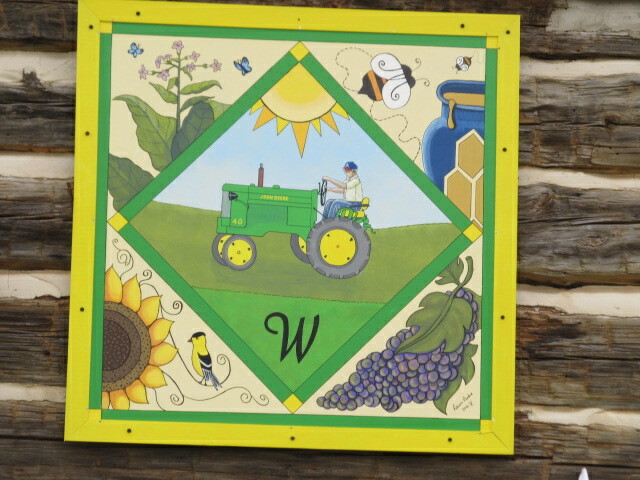 The quilt square is placed on a former tobacco barn and it depicts the farm’s past and future with images of tobacco leaves, grapes, sunflowers, honeybees, a model 40 John Deere tractor, and a W in the center for the family name. Mary Carter inherited this farm, which is named after a nick-name her grandfather gave her son. Located in rural Madison, it was historically a tobacco farm. Some tobacco is still grown there today as well as free-range chickens, produce and sunflowers. 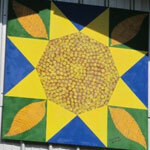 The quilt square features a large sunflower and tobacco leaves in the corners to depict the farm’s past and present. The quilt square located on this tobacco farm in Madison is designed from a quilt Ann Dixon’s grandmother made for her son and it is traditional wedding ring pattern. Her grandmother loved making quilts and this was a good way to honor that heritage. Ann’s parents owned the property and raised tobacco and grains, both of which are still grown there today. The Peck family farm is another former tobacco farm located in rural Mayodan. 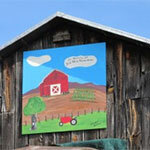 The quilt square hangs on the side of one of the farm’s original barns that is over 100 years old. The barn was a wood burning barn where tobacco was dried and cured. 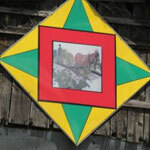 The quilt square features a farm scene with the barn and rows of tobacco as a tribute to the family’ heritage and in memory of J.P. Richardson, Janet’s father. Dwight Myers and Joann Biggs. Photo courtesy of Rockingham County Quilt Trail. This former tobacco farm in the rolling hills of Mayodan is where Dwight Myers’ family was raised. 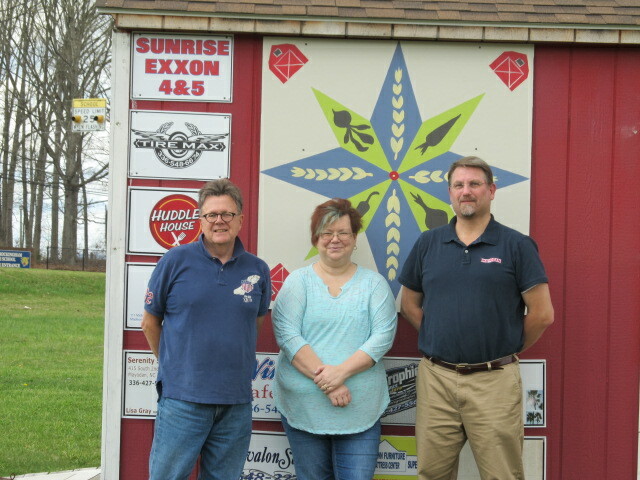 Tobacco was their livelihood for many years and the family wants to share that heritage by participating in the Rockingham County Quilt trail. 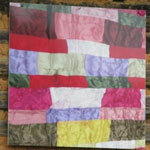 The quilt square hangs on a barn where tobacco was once strung by hand. The starburst pattern features tobacco leaves for their heritage and horseshoes as a tribute to the days when the fields were plowed by a mule. This farm has been in the Cardwell family since 1947. 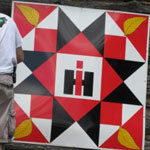 The family raised tobacco here and selected a pattern for their quilt square to reflect that heritage. 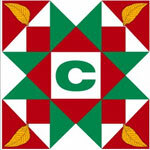 The pattern features tobacco leaves and a large “C” in the center for the Cardwell family name. The Cardwell farm spans more than 80 acres and formerly produced tobacco, beef cattle, chickens, eggs and hay. The barn featuring the quilt square was built in the 1950s by “Bennie” Cardwell, along with family and friends, during his weekend passes while in the US Army. The Cardwells raised chickens in order to teach their kids responsibility and the value of hard work. 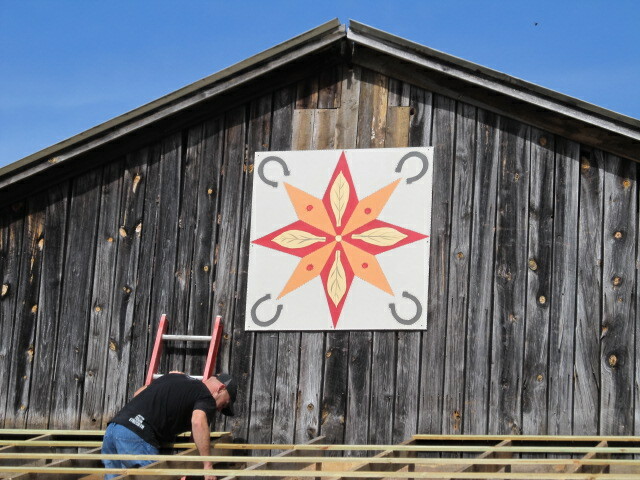 The Sutton family farm’s quilt square adorns a refurbished barn that was used as a pack house on this former tobacco farm in the “Ayersville” community in Mayodan. The family chose the plaid pattern for the background to represent their heritage. The Sutton coat of Arms is the predominant feature on this square. The blue at the top of the square represents heaven along with the star of heaven that was also added to depict Rockingham County as the north star of North Carolina. The site of the first square on the Rockingham County Quilt Trail, Amanda’s Daylilies is a daylily farm in Mayodan featuring over 1,500 varieties. 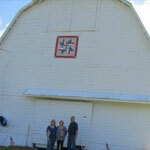 The quilt square hangs on the side of barn that is the oldest barn and a half in the county. The design features educational symbols that reflect the family’s connection to teaching. The building that now houses Countryside restaurant was built in the 1950s and has transitioned over time. It originally served as a local convenience store but has since been an arts & crafts store, restaurant, and now a country store and grill. Owners Darrell and Dawn Priddy selected the “blackbirds and berries” quilt pattern for their square because it compliments much of the art work seen inside the building and reflects their country store atmosphere. West Rock Farmers’ Market. Photo courtesy of Rockingham County Quilt Trail. The West Rock Farmers’ Market started in 2012 as a way to bring local produce and foods to the Western Rockingham County area. All items sold at the market are from within a 70-mile radius to ensure freshness. 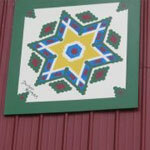 The Market’s quilt square is a starburst pattern featuring wheat stalks and produce sold there. 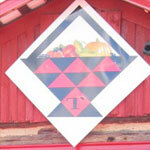 The red barn from the Market’s logo accentuates the four corners of the square. This location features two squares on the side of an historic brick building in downtown Mayodan. 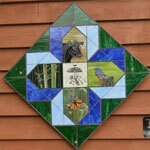 The squares were created by store owner Ann Stewart. One features the handprints of her four grandchildren. The other features a Mayo Spruce tree, which reflects the town’s textile heritage and was a trademark of the former Washington Mills Company. This quilt square is found on the top of a large stable on the former tobacco farm that originally belonged to the Carter Family. 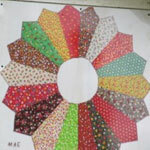 The design is a replica of a double Dresden pattern quilt made by the family’s matriarch, Mae Carter. Paul and Kristi Marshall converted this former tobacco farm into a vineyard and orchard in 2005. They grow muscadine grapes and pears. Riverbirch is entirely family-run as a way to carry on the farming tradition. 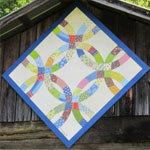 The quilt square is a photographic reproduction of a quilt Kristi’s mother made for the couple as a wedding gift. The pattern is a traditional, double wedding ring and the quilt has a very special meaning to the family. This former tobacco farm has been in the Burton family for 130 years. 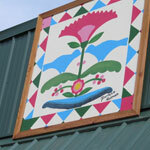 The quilt square is seen on the side of a log barn that has been covered in tin and was used as a pack house for storing tobacco. Current owners John and Peggy Burton are active in the Museum and Archives of Rockingham County (MARC)—the county’s history museum that is housed in the old Rockingham County Courthouse. 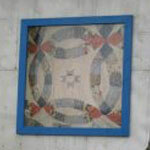 The design for the square mimics the star pattern in the mosaic tile floor seen in the old courthouse. They chose this design to help promote the MARC and reflect Rockingham County’s nickname as North Carolina’s North Star. This quilt square design features vintage artwork depicting the days when plow horses were used in tobacco fields. This farm has been in the King family since the 1940s and it was a tobacco, corn, hay and cattle farm. The quilt square design depicts the family’s love of flags and symbolizes their Christian faith with the cross in the middle. Jake Perkins has been raising ostriches for over 30 years on his farm and sells the eggs and meat, which is a low fat alternative to beef. 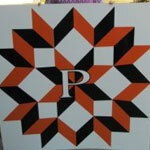 The farm’s quilt square features an orange and black color scheme as a tribute to the family’s tractor dealership that was in business in the ‘70s and ‘80s: Perkins & Sons Tractor Company. The pattern features a large P in the center for the Perkins family name. Once a sprawling 1,000 acres, this farm has been in the Jones family since 1858. Today Lucy (Jones) Mason owns the 58 acres where this square is located. The family raised tobacco at one time and still raise registered black angus cows today. 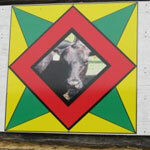 The quilt square design features a photo of one of their cows. 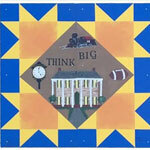 The City of Reidsville has two quilt squares at Market Square that depict iconic buildings and the way of life in Reidsville. One square shows historic buildings located in downtown Reidsville and gives a nod to the City’s rich farming and tobacco history by featuring a red tractor and tobacco leaves. The second square features the iconic Penn House, the historic home built by the Penn Family that now serves as a special events venue. It also includes a train, the town clock and a football– all of which have significant meaning to the Reidsville community. This tobacco farm has been in the Gillie family for four generations. The square design features tobacco leaves and the International Harvester logo in the center to reflect the family’s use of those tractors. 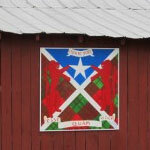 The quilt square hangs on the side of a barn that was used to cure tobacco. Harvest Ridge. Photo courtesy of Rockingham County Quilt Trail. This active strawberry farm in the “Ruffin” area of northern Rockingham County is also a great venue for concerts and events. 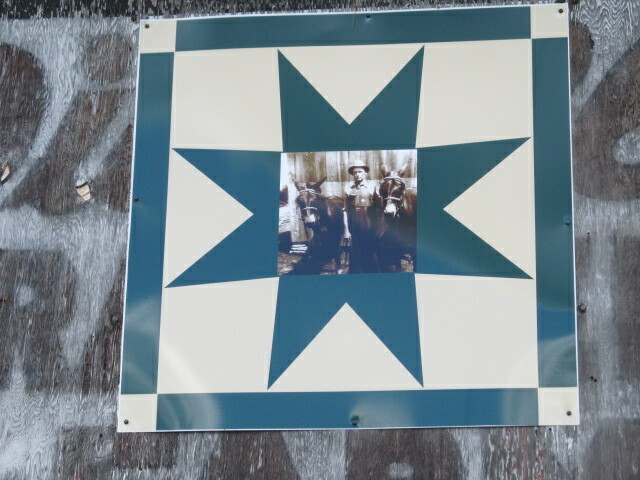 The quilt square features a large star design with a reproduced historic family photo in the center. James Lee and Jeanette Albert once raised tobacco on this farm but now raise horses and cows. Their quilt square adorns the side of a horse barn and features a ribbon design from a quilt Jeanette made using the cloth ribbons from flower arrangements given for her mother’s funeral in the 1960s. The Dalton family farm is located in Stoneville and is the former tobacco farm of the late Raymond Dalton who also founded Dalton’s Plumbing. 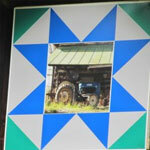 The quilt square honors Dalton’s legacy and adorns one of the barns where the family cured tobacco. The design features a photo of a 1963 Ford tractor—the one Dalton was most seen riding on in the fields. Helen Tuttle and her late husband D.L. are most known for their strawberries but the couple actually got their start in growing tobacco on this 86-acre farm in rural Stoneville. The Tuttle’s grew tobacco until 1992 as well as many other fruits and vegetables, which are still grown today. 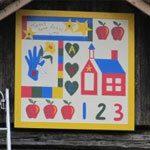 The quilt square design features a basket full of produce to reflect the farm’s crops as well as a large “T” in the center for the Tuttle family name. This location sits right along the side of Highway 65 in the rural Summerfield area on farmland that has been in the Gentry family for years. 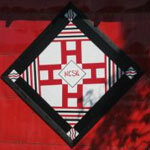 The quilt square reflects the family’s farming heritage with four large “H’s” as well as a black and red color scheme along with NCSU in the middle for their connection to NC State University. 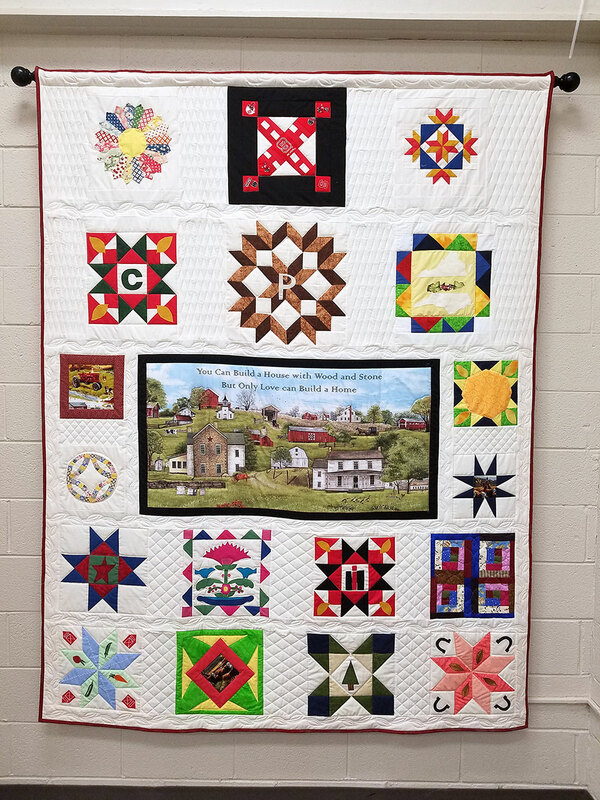 Extension Volunteers donated a quilt that highlights several of the barn squares in the county and is on display in the large meeting room at the Rockingham Extension Center. More to explore in the Dan River Region!